The GRIN State Meet is Set! The GRIN Board is thrilled to announce that the 2016 GRIN State Championship Meet will be held from May 7 – 8, 2016, at the Vigo County School Corporation Aquatic Center in Terre Haute, Indiana. This year’s State Meet will be hosted by the Terre Haute Torpedoes Masters. First formed in December 2007, the THT Masters are thrilled to host this year’s GRIN State Championships in their new state-of-the-art facility. The brand new pool is energizing their program and they are excited to share their pool with the entire Masters community. Their motto? “Train hard today; be a champion tomorrow!” Are you up for the challenge? Read about the Terre Haute Torpedoes Masters, contact Head Coach Randy Jensen or Coach Stephanie Hopkins for program information, and make plans now to attend the State Meet in May! The Vigo County School Corporation (VCSC) Aquatic Center is located at 2230 Prairieton Road, Terre Haute, IN 47802. 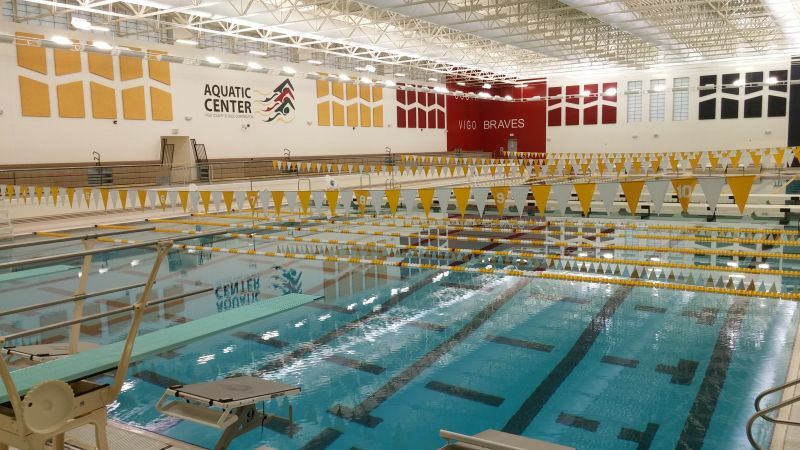 The VCSC Aquatic Center is a brand new state-of-the-art facility featuring a 10-lane, 50-meter competition pool with 2 moveable bulheads to allow for separate competition and warm-up / warm-down pools. Their Colorado Timing System features a full-color LED matrix scoreboard capable of showing full meet data and approved advertising. The facility also includes spacious locker rooms, offices, a large classroom, and a concession stand – all designed to handle the needs of a large event. Additional details, including the order of events, registration information, and hotels, will be coming shortly. Please stay tuned, but be sure to get this great annual competition on your calendars now. We hope to see you all in Terre Haute!